I’m writing this for the Film Noir Blogathon, put together for the benefit of preserving important film noir by the Self-Styled Siren and Ferdy on Film. I realize I’m late to this party — it took me a while to find an appropriate film because noir women often aren’t very interesting (and women are, after all, my thing on this blog). Lucky, then, that Otto Preminger’s Laura came to mind. 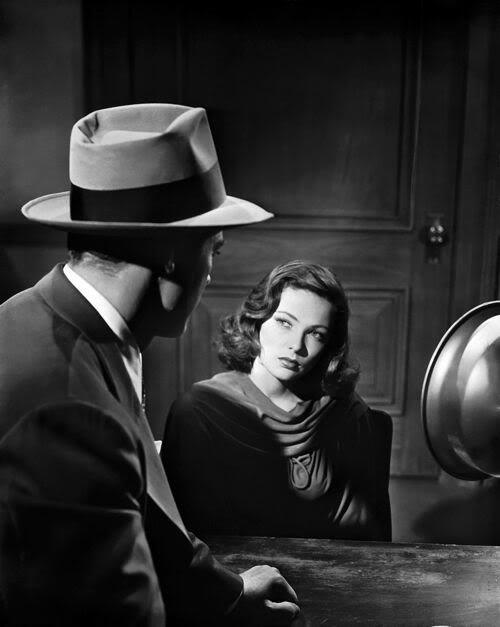 Gene Tierney was at the perfect height of her perfect beauty; we believe she’s been murdered for half the film, yet somehow she becomes nearly our protagonist by the end; she wavers between possibly murderous suspect and perfect wish-fulfillment fantasy girl. Most of all, she’s a strikingly sympathetic character for female viewers because of she’s a version of a self-made woman, yet she’s got only bad choices when it comes to men. In fact, I think one of the most fascinating subjects of this great film is class — hers, theirs, and what class does in relationships between men and women. At first, Laura Hunt (Tierney) is only the murdered girl, the one remembered by the other suspects because during her life she was fought over by two men: the middle-aged, imperious, deliciously venomous columnist Waldo Lydecker (Clifton Webb) and Shelby Carpenter (Vincent Price), a slippery, smooth-tongued Southern gentleman down on his luck. Fought over for good reason. Laura was smart and beautiful, came up through the ranks at her advertising agency, was beloved for her gentleness and elegance. They speak of her in reverent terms. 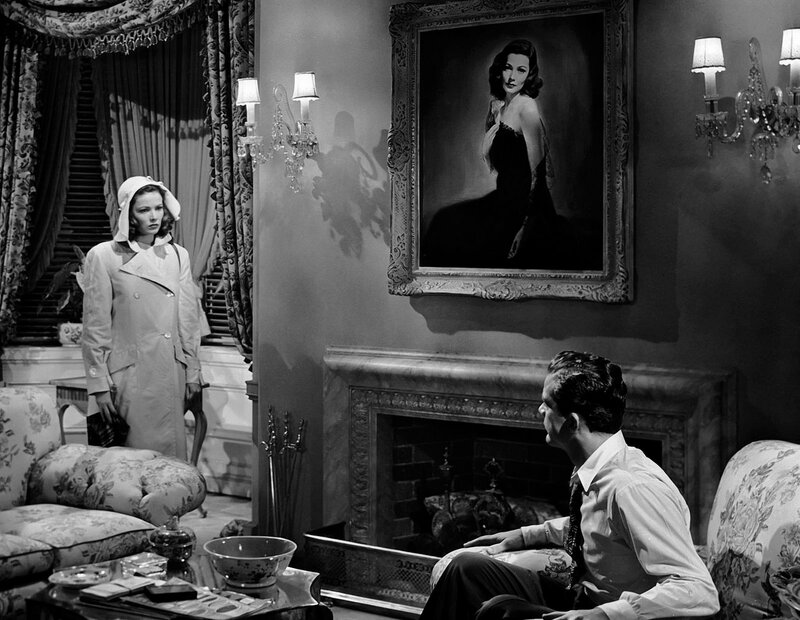 No wonder the detective assigned to the case, Mark McPherson (Dana Andrews), falls a little bit in love with her himself, and falls asleep in her apartment underneath her lovely portrait — raising the question why a 22-year-old career woman in 1940s New York would have her own portrait above the fireplace. It’s such a lovely picture, however, that we don’t wonder for long. Laura had innate breeding, but she deferred to my judgment and taste. I selected a more attractive hairdress for her. I taught her what clothes were more becoming to her. Through me, she met everyone. The famous and the infamous. Her youth and beauty, her poise and charm of manner captivated them all. She had warmth, vitality. She had authentic magnetism. Wherever we went, she stood out: men admired her, women envied her. She became as well known as Waldo Lydecker’s walking stick and his white carnation. But Tuesday and Friday nights we stayed home, dining quietly, listening to my records. I read my articles to her. The way she listened was more eloquent than speech. These were the best nights. Then one Tuesday, she phoned and said she couldn’t come. Shelby’s motives are even less attractive: having come into Laura’s life after her professional and social successes, he wants to ride her coattails — she’s already given him a job at the firm — and, probably, milk her for cash. In short, for Shelby Laura is a guarantor of status and income, while for Waldo she’s the perpetually grateful recipient of a hand up. Nor are we viewers confident things would be different with Mark. Waldo’s right: Mark calls women “dames” and “dolls,” laments the time a “doll in Washington Heights got a fox fur out of me,” and seems partly impressed with Laura because she’s just so exotic to his gritty life. Sitting in her crazily feminine apartment he seems almost creepy, even as we forgive him his awkwardness. Who is this Laura, really, with all these different views of her? Complicating this smoky view of the film’s central figure is its propensity to shift protagonists. At first it would appear Waldo is our man, with his snarky narration and terrific gift with one-liners (the screenplay is perfect, most of all when a good line is handed to the brilliant Clifton Webb). Mark McPherson is a laconic, unassuming character with the questionable habit of toying with a little pocket puzzle rather than look anyone in the eye. But suddenly 30 minutes in, a long shot of Mark signals that things have shifted; we start following his investigation and privileging his view of the case, especially as he thumbs through Laura’s diary and letters or interviews her devoted maid, Bessie. Yet even as we watch Mark become obsessed with the dead girl, he’s more of a mystery than a full-fledged protagonist — so when Laura reappears in her apartment demanding to know what he’s doing there, we might be ready to shift our loyalties to her. Except for the fact that if she’s not the victim, she might be the murderer. According to old-movie and film-noir logic, it’s natural that Laura would fall in love with Mark — our damaged protagonists should always get the girl in the end. But female viewers might view this narrative progression sideways. She clearly makes more money than this down-in-the-mouth detective and lives a more glamorous life with that money. When we see her deal gracefully, effortlessly with the maid Bessie as if she’d had hired maids all her life, we get an indication not just of that “innate grace” Waldo described; but we also see that Mark shares more in common with Bessie than with Laura. With his clenched-jaw lack of conversation, he won’t just fit in to her life, which means that perhaps she’ll be the one to sacrifice it to be his wife. Or will this be yet another of her brief, unsatisfying relationships with inappropriate men? That’s the most likely scenario; we won’t arrive at the answer, of course, because the film ends too soon. But we can speculate and think about how Laura‘s shifting protagonists begs female viewers to perceive a different narrative emerging from the film. Maybe I’m reading the film anachronistically — maybe we’re supposed to see Laura as a woman who makes do with the inadequate men presented to her. But somehow I don’t think so. I think one of the reasons this film still works so well is that nagging feeling one still has at the end, even after the murder mystery has been cleared up, that there’s still more misery in store for our heroine. Well worth the wait !!! Just great writing and wonderful insight. I’ve not seen this one, and likely won’t. After reading your long treatise I can’t go into the film with so much knowledge already kicking around upstairs. It’s like I’d be seeing the film through your eyes rather than the directors or my own.Ah, the power of the written word…. Aw, man, that is NOT the response I want. Laura is just one of the best films ever, one I’ve seen many times and enjoy again & again. See it, JMM — you won’t be sorry! Wow! I didn’t realize that Mark McPherson was so inadequate. Or do you feel that way about all of the male characters? Of course not! but Mark really is one of the most insecure heroes of noir. I love love love this film, in part of how incongruous they seem together; it rewards viewings every time. And that music! You know, there kind of is a sequel — well, not a sequel at all, but a wonderful film called Where the Sidewalk Ends (1950) with both actors in a story that is so wonderfully relevant to the earlier Laura that they really need to be seen in tandem. I’d have a hard time telling you which film I like better.